*NEW Jumbo Mixed Pack Special! Now buy a MIXED size pack! Not sure about the size? Now you can order a mix of 1 Small, 1 Medium and 1 Large Ring Guard(Jumbo not included). For $12.75! A short 30 second instructional video. You can see an easy "step by step" guide on how to apply a ring guard / ring wrap to your ring. This ring guard video will load directly onto your screen. No downloading needed Read more..
On this page you can find a static image guide to putting a ring guard on. Each step is a snap shot - from molding to tightening. Print it off and have it on hand when putting your ring guard on..	Read more..
Our Jumbo Sized ring guards are a bit different to put on. You can find a "step by step" guide in images at this link Read more..
Finding your ring size is not a perfect science, print up our finger chart to find a close fit... Read more.. 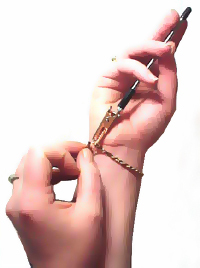 The Bracelet Helper gives you a helpful "extra hand", holding one end of a chain bracelet, making it easy to fasten the clasp with your other hand, all by yourself. Read more..
All orders are shipped using USPS, find out more on shipping by following the link below. All orders over $25 will have FREE SHIPPING. Guarantee:We Guarantee you are delighted with our products or your money back! Read more..
Swollen knuckles making your ring TOO loose on your finger? Gems and precious stones ending up on the palm side of your hand? Fingers swell or shrink depending on the weather or time of year? Afraid to size your ring in case your weight changes? Our 14 k gold-filled Ring Size Adjuster allows the ring to expand over the knuckle, yet fit snugly & comfortably...so WHY PAY A JEWELRY STORE TO SIZE A RING - when you can do it yourself for less! Will Ring Guards be Easy to Put on Myself? All you need is a pair of pliers (or strong flat tweezers) to bend the ring guard around the band. Once the ring guard is in place just push up on the ring wrap to adjust the size. This ring guard video will show you exactly how to put on and adjust your ring size instantly. No downloading needed...(ring guard video) IT'S THAT EASY! Easy to remove as well. Ring Guards come in 4 Sizes: Small, Medium, Large and Jumbo Sized. Not sure about the correct ring guard size to buy? Now you can order a mix of Small, Medium and Large Ring Guards (Jumbo not included). For $12.75! Read more..
Children's rings that will soon be grown into. Ring guards are easy to put on and take off. Let your children wear rings for special occassions without worry about it getting lost. 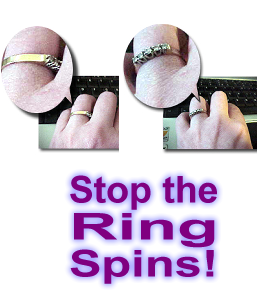 Remove the ring guard when the ring begins to fit properly on your childs finger. 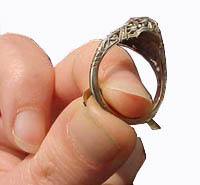 Rings that fit over the knuckle but always tend to slide on the finger. Ring guards can be adjusted for a tighter fit after passing the knuckle. Keep your stones upright by slightly pressing up on the "wrap" while the ring is on your finger. When the engraving may be cut off with sizing. Ring guards are 14K gold filled. Occasional swelling of the fingers. Ring guards can be adjusted easily when a tighter fit is needed. A Trouble-Free Way To Fasten Your Own Necklace Clasp! Magnetic clasp converters quickly and easily modify most finished necklaces into magnetic clasp necklaces. Easily used by people who have difficulty opening and closing conventional clasps. Read more..
4 styles to choose from! Including our most popular safety chain with spring clasps on both ends. Provide greater lift and support, reduce shoulder indentions and discomfort and eliminate falling bra straps.